One small accident, a virus, or hard drive failure can destroy all the important stuff you care most about on your computer. 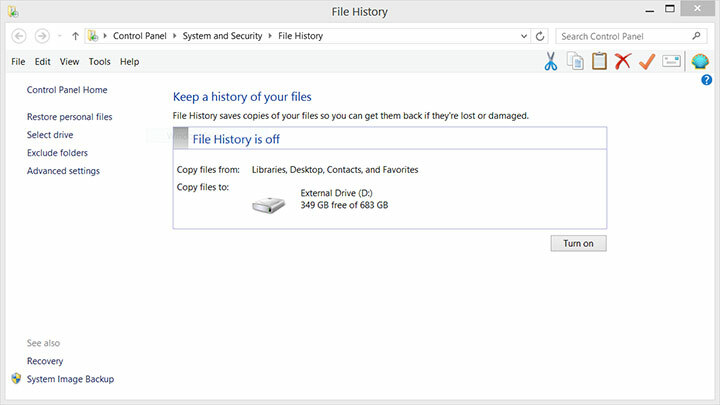 Although there are many good backup programs you can install to protect your files, Windows already has easy to use, built-in tools to automatically save copies of your data to an external hard drive or a shared network location. Here's how to set it up. The steps below will offer local backup for your data, which is great for having immediate access to your files in case your hard drive crashes or you accidentally overwrite a file, but remember that you'll also need offsite (e.g., online) backup. Local backups won't help in the common scenarios of your computer getting lost or stolen or damaged during a fire or natural disaster at your home. Let’s talk about backing up your Windows computer as the first part of your backup plan. The good news is that Windows' backup tools are quite easy to use and, like using online backup services, you only have to set it up once to get automatic and continuous backups of your files. The steps below will back up the irreplaceable files you most care about, such as your documents, photos, videos, and browser favorites. Search for "backup" in Windows to find the backup tool. In Windows 7, that means clicking the Start button, then typing in "backup" in the search box, and clicking on "Backup and Restore." 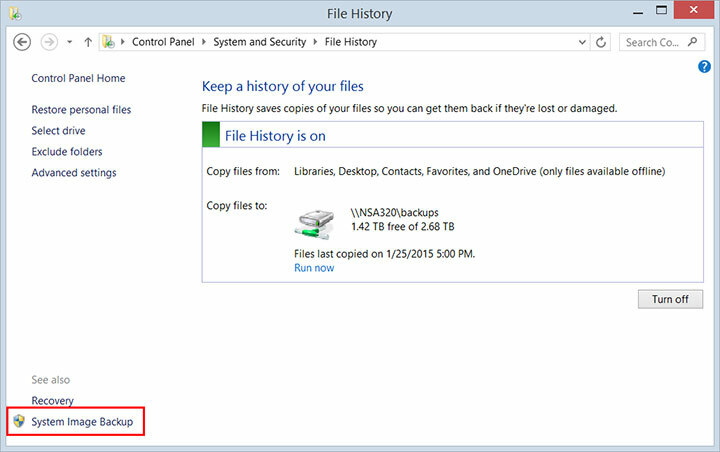 In Windows 8, you can just start typing "backup" on the start screen and then choose "Save backup copies of your files with File History." 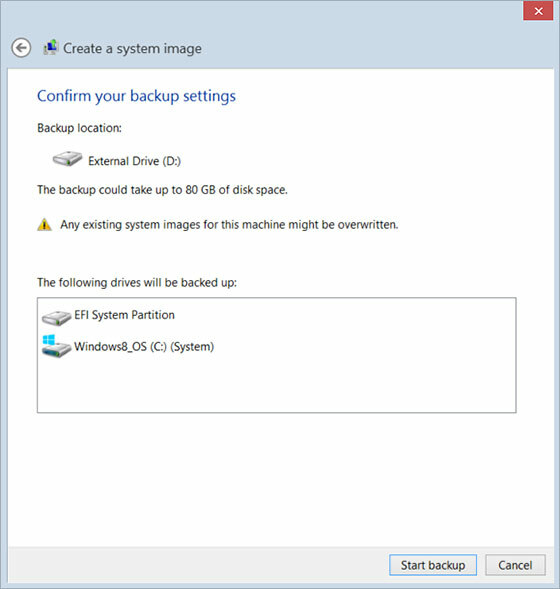 Click the "Turn on" button in File History (Windows 8) or the "Set up backup" link in Backup and Restore (Windows 7) to start the setup process. 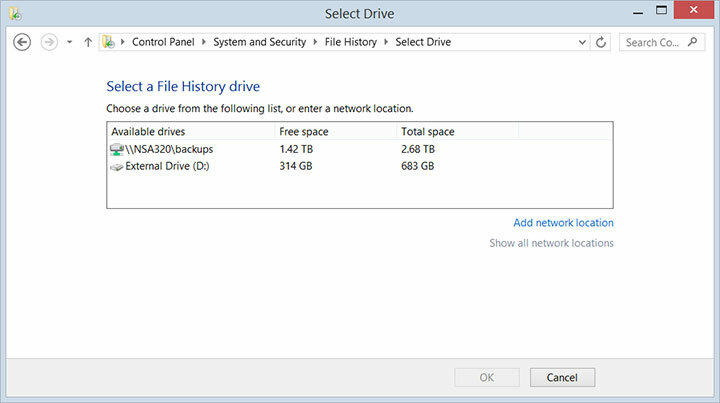 Windows 7's Backup and Restore tool asks you to either let Windows choose what to backup or select your own folders. If you let Windows choose, it will automatically save the files in your libraries, desktop, and default Windows folders, as well as create a system image for restoring your computer as a whole if it stops working.  (Note that it will not back up Program Files, any files formatted in the FAT file system, deleted files in the Recycle Bin, or temp files with a size of 1GB or more.) 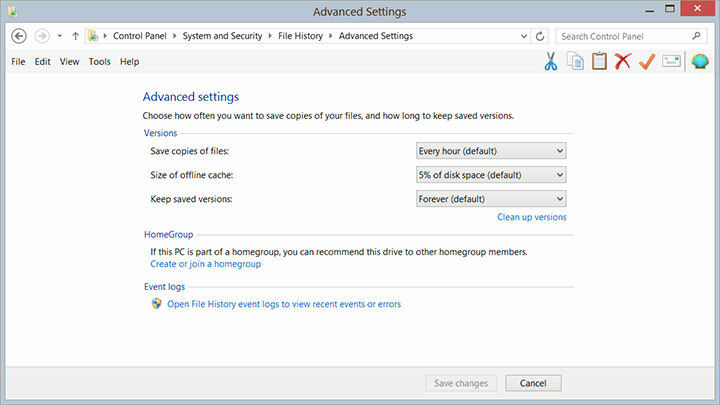 If you choose what to back up yourself, you can select specific folders to include or exclude and can select the option to create an image of your drive. 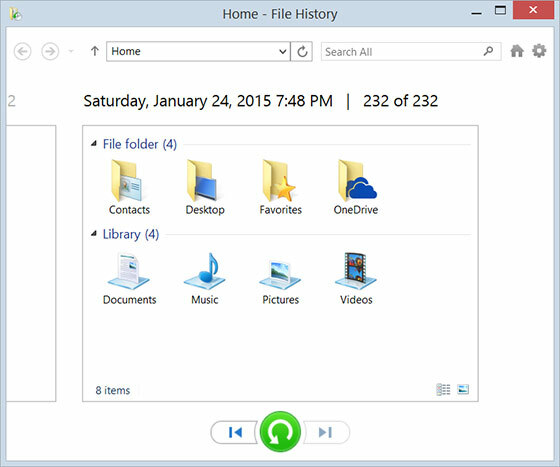 Windows 8's File History chooses the folders for you and will automatically save files in your Desktop, Libraries (Desktop, Documents, Downloads, Music, Pictures, Videos), Contacts, and OneDrive folders. You can exclude folders from your Libraries you don't want backed up, such as program-generated folders (e.g., that empty "Adobe PDF" folder) that will just get recreated if you have to reinstall the program. But wait. You might also want to adjust the backup settings for your needs. You can change how often the backup will run and other details. Backup schedule: In Windows 8, go into the advanced settings (by clicking on the "Advanced settings" link in the left menu after turning on File History) or, in Windows 7, click on the links to "Change schedule" to adjust how often you want the backup to run. By default, Windows 7's Backup and Restore runs once a month, while File History on Windows 8 runs every hour. You can make these more or less frequent if you like. Backups are only as good as your ability to restore them. Too often, people think they've got a good backup, but when they go to restore the files, they're devastated to find the restoration process fails. (This happened with Pixar, when the company almost accidentally deleted Toy Story 2 and found that all of their backups were no good--except for one copy the technical director had been keeping on her home computer.) This is also another reason to have multiple backups on external drives as well as on a reliable online backup service. So whether you actually need to restore some files or not, it's a good idea to test your backups every now and then (about once a month) by restoring a file or two. s before, search for "backup" to open the Backup and Restore tool (in Windows 7) or the File History tool (Windows 8). Then click on the "Restore personal files" link in the left pane in the File History window or the "Restore my files" button in the Backup and Restore window. In Windows 8, you can select the files or folders to restore by clicking the checkbox that appears next to the folder or filename when you hover over the item. By default, you'll see the latest versions of your folders, but you can click the back arrows to see earlier saved versions. In Windows 7, you have three buttons: Search (to find files by name), Browse for Files (to restore individual files), or Browse for Folders (to restore an entire folder). 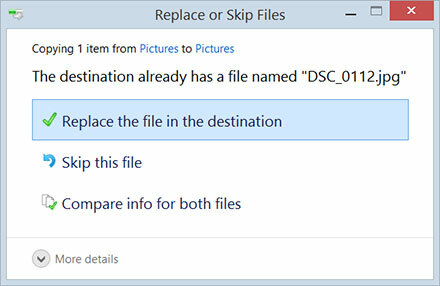 Windows 8 will put the files back to their original location, but if you already have a file with the same name there, you'll be asked to either replace the file, skip it, or compare the files so you can make a decision. Windows 7 lets you choose the location where you want to restore the files, as well as choose what to do if there's a filename conflict. After you make your decision, Windows will restore your files. If everything looks good, click the "Start backup" button to create the system image. At the end of the backup process, Windows will ask you if you want to create a system repair disk on a CD or DVD. This will help you boot your computer and recover Windows from a serious error, so you should go ahead and say yes to creating the repair disk. Unlike the Windows backup tools mentioned above, you can't restore individual files from the system image--everything on your drive will be replaced during the restoration process with the system image contents. If you only want to be able to restore select folders, File History or the Backup and Restore tool will be better and also use up less disk space. Finally, the tool doesn’t let you schedule system images to be automatically created, but this makes sense because you wouldn't want to accidentally overwrite a good system image with one that doesn't work. Here's how to create the system image in Windows 7 and Windows 8. You can save the image to an external drive, one or more DVDs, or a network location. If you choose a network location, Windows will warn you that the backed up data "cannot be securely protected for a network target." That just means that other users who have access to the location could access your system image (so only save the image to a network location when you trust everyone who has access to it). In the next screen, you can select additional hard drives you have attached to your computer to also back up, but these will add to the space needed. If everything looks good, click the "Start backup" button to create the system image. At the end of the backup process, Windows will ask you if you want to create a system repair disk on a CD or DVD. This will help you boot your computer and recover Windows from a serious error, so you should go ahead and say yes to creating the repair disk. Here are the steps if you want to recover your entire computer from a system image file. This will replace the contents of your PC's drive with the programs, settings, and files saved in the system image. In the Windows 8 start screen, type "PC settings" to search for and open the settings app. Next, click the "Update and recovery" link in the left pane and then the "Recovery" link. In Windows 7, click the Start button, search for "recovery" in the search box, and then click "Recovery." To restore from a system image, you'll need to go to the advanced recovery settings. In Windows 8, click the "Restart now" button under Advanced startup. In Windows 7, click "Advanced recovery methods." 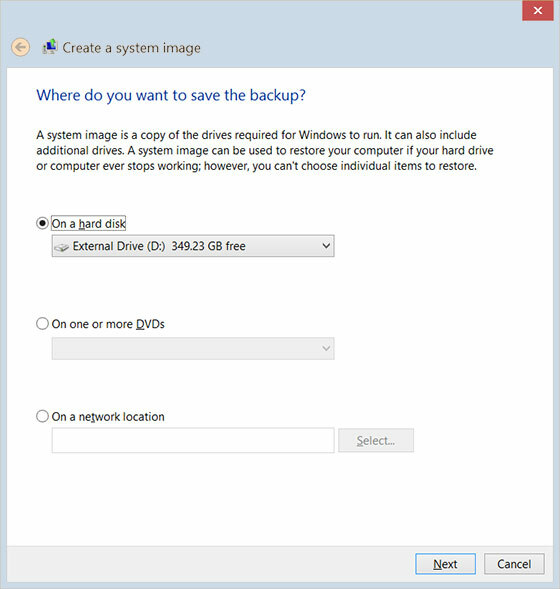 Finally, in the Advanced options screen, click the "System Image Recovery" option (Windows 8) or the "Use a system image you created earlier to recover your computer" option (Windows 7) and follow the prompts to select the system image and do a full-system restore.